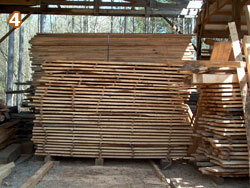 Sell & Associates, Inc. | Custom cut lumber for homes, flooring, cabinetry, barns, fencing, and furniture. Whatever your lumber needs, I have the experience and expertise as a reliable source of custom cut lumber, design, and construction. A business owner since 1972, I understand the value of being responsive to customer needs and remaining current with product knowledge and market trends. A graduate of the University of Georgia in 1967 with a Bachelors degree in Landscape Architecture, my reputation as a naturalist designer solidified my customer base, growing my reputation in landscape design and construction. Accepting the challenges of savvy eco-friendly buyers, I expanded my landscape business in 1979 with the addition of log home design and construction. The destruction of timber on my family owned tree farm caused by the hurricanes in the 1990s peaked my interest to find alternative ways to recycle the downed trees rather than disposal in landfills. 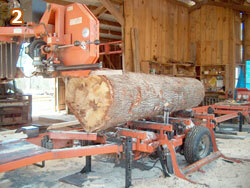 I started cutting logs with a Wood-Mizer Super LT40 bandsaw to fulfill my personal needs. 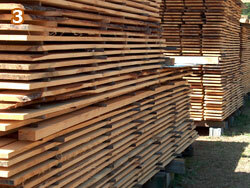 The sawmill business grew with a renewed interest by homeowners, building contractors, architects, designers, and crafters increasing the demand for custom cut lumber, and hard-to-find species and reclaimed lumber. For greater efficiency and higher production capacity, I added a Wood-Mizer LT70 bandsaw, a twin blade Wood-Mizer Edger to provide a clean, square-edge to rough-cut lumber, a kiln for drying lumber, a 24" Power Matic planer for milling rough lumber to finish lumber, a 16" joiner for edging and finishing lumber, and a shaper for milling ship lap siding. Logs in place for cutting. 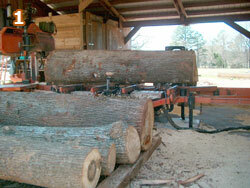 Log being cut on the Wood-Mizer LT70 bandsaw. Logs cut and stick-stacked for air-drying. 3,000 Board feet of Pecan boards air-drying. 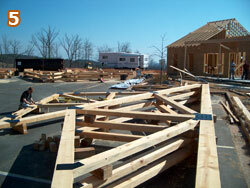 Assembly of a truss cut for a country club in Thomaston. 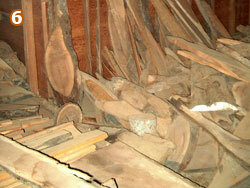 Remnants used for wood-carvers, musical instruments, turning, and furniture.